frozen yogurt | Badudets Everything Nice! Frozen yogurt is so popular nowadays and is considered as the “it” dessert. I guess I’m joining the frozen-yogurt-for-dessert bandwagon too. While looking for some place to rest our feet from serious walking at the Mall of Asia, I spotted The White Hat and immediately asked Jeff and Nanay if they’re game for dessert so as to rest, too. 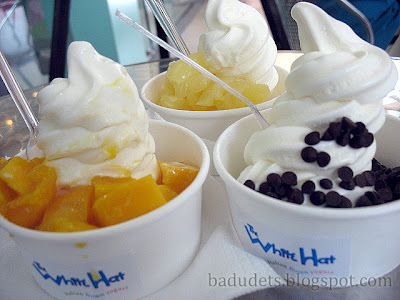 The White Hat serves authentic Italian frozen yogurt and has branches at the Mall of Asia and Robinson’s Place Manila. The store’s oh-so-cutesy interior is as delightful as the vast array of toppings to choose from to go with your frozen yogurt. They have everything from nuts, fruits, chocolates, syrups and even sesame mochi. We ordered pineapple toppings for Nanay, mango toppings for Jeff and dark choco bits for me. The first bite is heavenly, it’s not as sour as your usual yogurt and you’ll enjoy its creaminess. It’s as if you’re eating a vanilla ice cream, only BETTER! Why better? it’s 98% fat-free! And I do not need to elaborate the benefits of yogurt to our body, they’re just good! One regular cup (4 oz.) 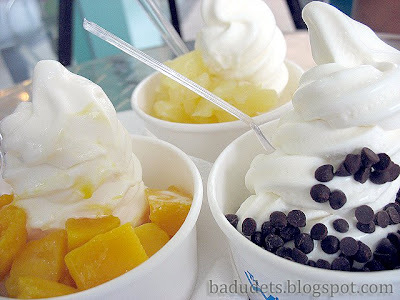 of frozen yogurt is Php 85 and large cup (6 oz.) is Php 115. An additional Php 20 for every toppings you put in your frozen yogurt. Pretty decent price considering that you’re eating healthy and delicious. If you’re saving up, you can eat them without toppings and they’re just as good too.